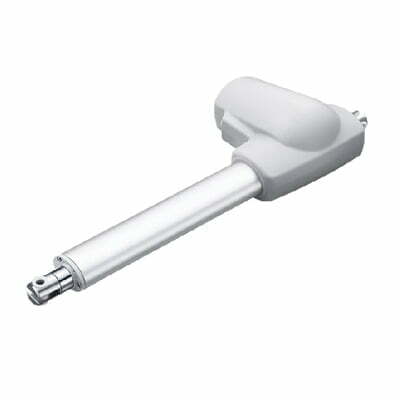 Low-Noise compact actuator for medical applications. 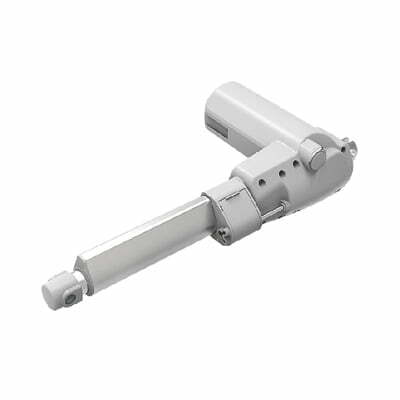 Movetecs MLA16 is designed for low-noise medical applications and where a compact actuator is needed. MLA16 is available with IP54 or IP66 protection. 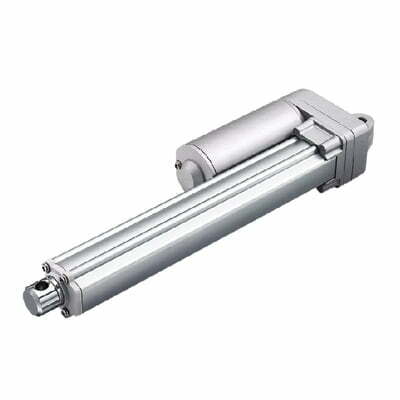 The actuator is designed for loads of max. 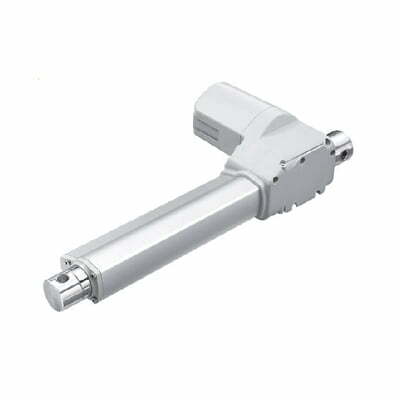 3500N in push/pull and can be moved up to 23,5mm/s without load. MLA16 – high stability and a reasonable price level. Plug & Play! Plug & Play: You can also get MLA16 as a complete Plug & Play solution, including one or more MLA16 actuators, a Movetec control box 230V AC, all cables and a control panel. By Selecting a control box with Bluetooth®, MLA16 are easily controlled by iPhone® or Android®-Smartphone. 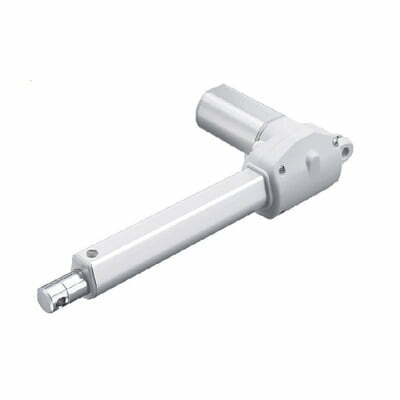 Actuator drive parts: Aluminium, Steel, ABS, POM, PP and others. Options: Bluetooth® controlling for iPhone®- and Android® Smart-phones. Potentiometer. 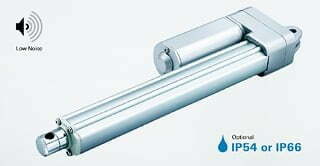 IP54 or IP66 protection.12V DC. 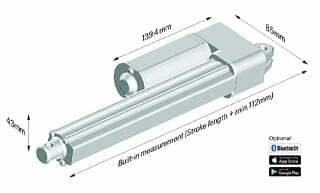 Danish MOVETEC offers very versatile actuators. You will have seen actuators at work in height-adjustable desks in offices. 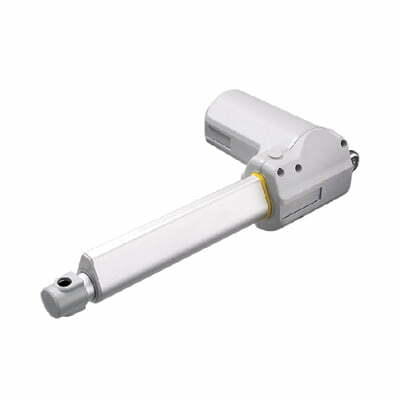 Essentially a telescopic device, an actuator is a hi-tech electrical “arm” that, when connected to an electric motor, can raise and lower or pull and push to the side. MOVETEC has developed a broad range of high-quality aluminium actuator solutions. We deliver actuators individually, in pairs and in systems comprising up to 12 synchronised actuators, which can adjust e.g. a complete conveyor belt or packing station. Actuators help to make workplaces ergonomically better. Actuators are used not only in office environments. They are also widely applied in industry, laboratories and the healthcare sector, where they help to relieve the strain of heavy lifting and give users an opportunity to adjust their workplace precisely to fit. Actuators can also be used to raise sofas and tables at care homes, in hospitals and even in private households. MOVETEC develops actuators in-house. We have recently launched new models. Our actuator systems are adapted, assembled and tested at our workshops in Middelfart (Denmark) and then shipped to dealers and end users across the globe. 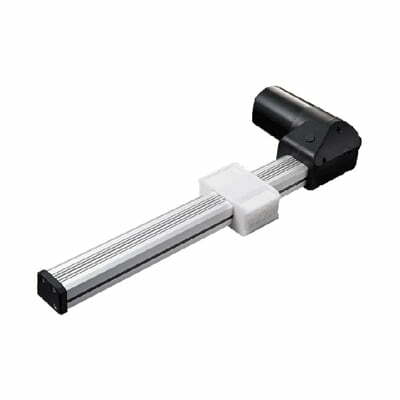 Actuators are often component parts of the base or skeleton of workstations and larger workspace solutions. 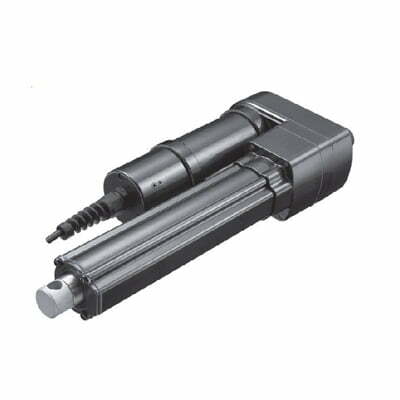 To offer as broad a range of actuators as possible, MOVETEC offers customised actuator solutions. MOVETEC profiles are also produced in Denmark. MOVETEC actuators can be controlled using the up and down buttons that most of us recognise from our office desks, but we also supply more advanced solutions that can be programmed to operate with multiple pre-set heights/stroke lengths. Customers can also choose a wireless Bluetooth control unit that communicates with another wireless device or via a Smartphone. Actuators are very widely used in industry, automation, energy/utilities, agriculture, ventilation, solar screens, solar energy, logistics/conveyors, industrial kitchens, the medical industry, hospitals and care sector, marine applications, vehicles/trailers and agricultural machinery. In fact, they are applied everywhere you need to raise, lower, push or pull. 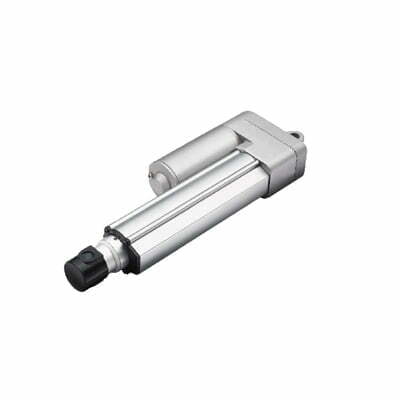 MOVETEC can supply actuators with max. load of up to 10,000 N. If you require max. load in excess of 10,000 N, we can connect and synchronise multiple actuators, i.e. 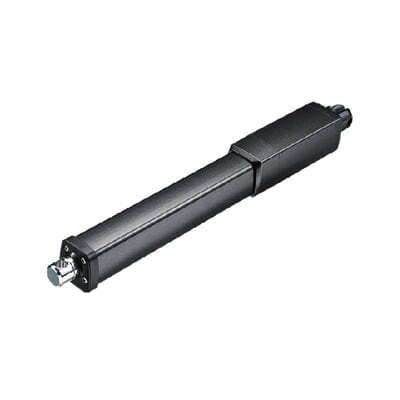 up to 12 actuators is our standard offer! 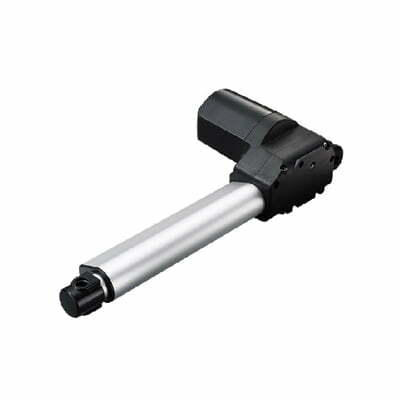 Danish MOVETEC offers very versatile servos. You will have seen them at work in height-adjustable desks in offices. 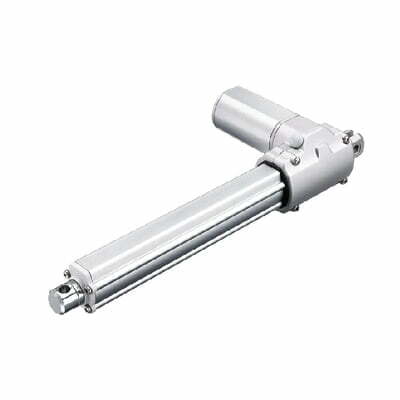 Essentially a telescopic device, a servo is a high-tech electrical “arm” that, when connected to an electric motor, can raise and lower or pull and push to the side. 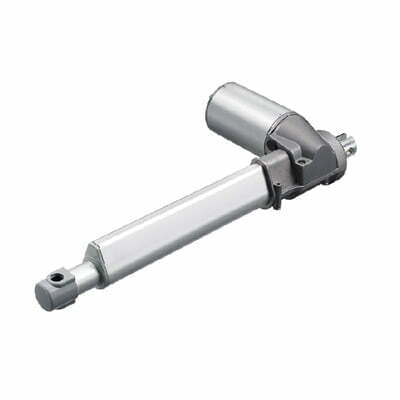 MOVETEC has developed a broad range of high-quality aluminium servo solutions. 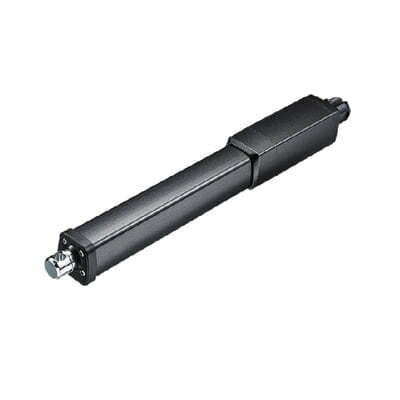 We deliver servos individually, in pairs and in systems comprising up to 12 servos, which can adjust e.g. a complete conveyor belt or packing station. Servos help to make workplaces ergonomically better. Servos are used not only in office environments. They are also widely applied in industry, laboratories and the healthcare sector, where they help to relieve the strain of heavy lifting and give users an opportunity to adjust their workplace precisely to fit. Servos can also be used to raise sofas and tables at care homes, in hospitals and even in private households. MOVETEC develops servos in-house. We have recently launched new models. Our servo systems are adapted, assembled and tested at our workshops in Middelfart (Denmark) and then shipped to dealers and end users across the globe. Servos are often component parts of the base or skeleton of workstations and larger workspace solutions. 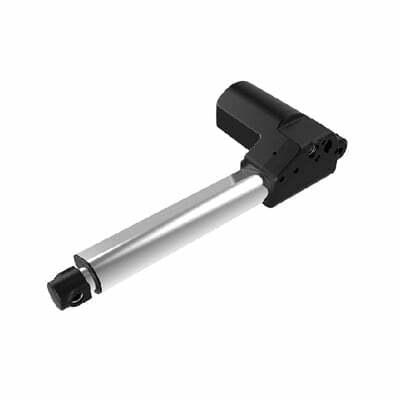 To offer as broad a range of servos as possible, MOVETEC offers customised servo solutions. MOVETEC profiles are also produced in Denmark. MOVETEC servos can be controlled using the up and down buttons that most of us recognise from our office desks, but we also supply more advanced solutions that can be programmed to operate with multiple pre-set heights/stroke lengths. Customers can also choose a wireless Bluetooth control unit that communicates with another wireless device or via a Smartphone. 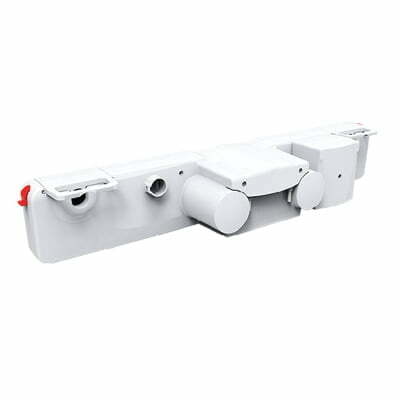 Servos are very widely used in industry, automation, energy/utilities, agriculture, ventilation, solar screens, solar energy, logistics/conveyors, industrial kitchens, the medical industry, hospitals and care sector, marine applications, vehicles/trailers and agricultural machinery. In fact, they are applied everywhere you need to raise, lower, push or pull. MOVETEC can supply servos with max. load of up to 10,000 N. If you require max. load in excess of 10,000 N, we can connect and synchronise multiple servos, i.e. up to 12 servos is our standard offer!